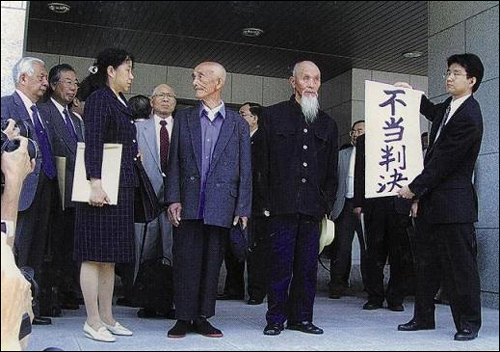 Former forced laborers and family members at the Beijing Fang Yuan Law Office in 2000, prior to filing redress lawsuits in Fukuoka. At a moment when the "comfort women" controversy is dominating the growing global discussion about Japanese war responsibility, the Japan Supreme Court is set to permanently foreclose the possibility of redress for Chinese war victims within the Japanese court system. Japan's top court will hold a special hearing on March 16 in a compensation lawsuit brought by Chinese forced labor survivors against Nishimatsu Construction Corp. and the Japanese government. If, as expected, the Supreme Court rules that the victims' right to file the claim has been extinguished by state treaties, it will ensure final defeat for all lawsuits by Chinese victims filed in Japanese courts. Compensation claims for forced labor have been the most common, and most successful, type of lawsuit within the wave of litigation by Chinese plaintiffs that began in 1995. District courts have issued compensation rulings on three occasions, while the Hiroshima High Court ordered Nishimatsu to pay plaintiffs in 2004. Most claims have been rejected due to state immunity and filing deadlines, even as courts have routinely found that the Japanese state and companies engaged in illegal forced labor. The key question of whether Chinese victims have standing in Japanese courts at all has been largely sidestepped -- until now. During a trip to Beijing last month, Japanese lawyers handling the forced labor lawsuits warned plaintiffs and the Chinese media to brace themselves. The Supreme Court will likely decide that the Joint Communique signed by China and Japan in 1972, or the Sino-Japanese Peace Treaty signed by Taiwan and Japan in 1952 (also called the Treaty of Taipei), or both, waived the right of Chinese individuals to seek redress from the Japanese government or corporations. Although Beijing has never officially interpreted the 1972 accord as allowing lawsuits against Japan, China's foreign minister stated in 1995 that the Joint Communique waived only the Chinese government's reparations claims against the Japanese government, while leaving the claim rights of private Chinese citizens intact. Japanese lawyers, historians and citizen activists have vigorously supported the more than two dozen lawsuits filed by Chinese victims of biological warfare, abandoned chemical weapons, the Nanjing massacre, the Pingdingshan massacre, indiscriminate aerial bombing, military sexual slavery, and forced labor in Japan. Nearly all suits have failed, but many Japanese judges have engaged in historical "fact-finding" instead of rejecting claims without comment. This has produced an incontrovertible record of Japan's war conduct where little or nothing existed before. For example, whereas the Japanese government today insists it knows nothing about the activities of Unit 731, a Tokyo court concluded that the unit killed many Chinese through biological warfare and human experimentation. And while Mitsubishi Materials Corp. describes Chinese at its wartime coals mines in Japan as well-treated voluntary workers, a Fukuoka court confirmed they were victims of brutal forced labor. 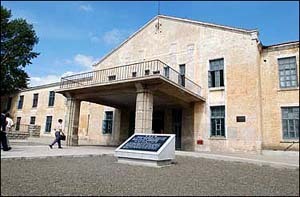 The former Unit 731 headquarters in Pingfang is now a museum, located about 47 kilometers outside Harbin, the capital of Heilongjiang Province (former Manchuria). Japanese judges have occasionally even suggested that the government should proactively settle claims from Chinese war victims via national legislation and a compensation fund, the approach by which Germany and Austria have recently come to terms with Nazi-era forced labor. If the Japan Supreme Court does end the Japanese judicial phase of the Chinese reparations movement, a vital vehicle for educating the Japanese public about their nation's inadequately understood past will be lost. An important source of potential pressure on the Japanese state and industry to sincerely address victims' claims will be removed. Yet the reparations campaign is sure to continue, and may even intensify, as the focus of efforts shifts to China. The Chinese government has recently allowed families of former forced laborers to form a support group for redress activities, and permitted establishment of the Non-Governmental Fund to Support Lawsuits by Victims of the Japanese Army's War of Invasion. The fund was tapped last November to bring the largest-ever delegation of 86 forced labor survivors and supporters to Japan. In early 2006 the Chinese government announced via state-controlled media that, in an unprecedented step, it would soon allow former forced laborers to sue Japanese corporations in Chinese courts. A new group, the Non-Governmental Chinese Association for Claiming Compensation from Japan, was launched and the best-known advocate of the private compensation concept, Tong Zeng, was named as its head. The first prospective plaintiff was also named by Chinese media last year, but Beijing authorities have so far failed to follow through on their promise of a domestic judicial arena for redress. A Chinese lawyer told the New York Times last fall that the Chinese government is waiting to see how the Japan Supreme Court rules. Compensation lawsuits in Chinese courts could produce a public relations disaster for Japanese companies, especially for firms inclined to deny the historical reality of forced labor even as they pursue contracts in China, although the Chinese state has previously made clear that it will not allow organized consumer boycotts. The popular legitimacy of the Chinese Communist Party depends in part on its taking a firm stand against rising Japanese nationalism and historical revisionism, and 2007 marks the 70th anniversary of the start of the Sino-Japanese War and the Nanjing Massacre. This could lead to increased bottom-up pressure on the Chinese government to back reparations demands against Japan more actively, especially if (as the article below explains) Tokyo is seen to be challenging Chinese sovereignty over Taiwan. Without greater state-level support from Chinese leaders, the reparations claims are likely doomed to failure. That would make meaningful reconciliation between the two nations even more difficult, as the descendents of actual victims carry on the redress struggle and acrimony toward Japan becomes entrenched at the level of national identity. Chinese attorney Kang Jian is known as the "window" between Chinese claimants and Japanese supporters advancing their legal efforts in Japan. Since becoming aware of the comfort women redress movement at the U.N. Beijing Conference on Women in 1995, Kang has been in the forefront of the All China Lawyers Association's pursuit of compensation for forced labor and other Japanese war crimes. She has traveled around the Chinese countryside to help select the most effective plaintiffs for lawsuits in Japan and frequently testified in Japanese courtrooms. Kang's article focuses on the Japan Supreme Court's upcoming hearing and provides a map of the legal landscape involved, even as the reparations question is ultimately moral and political in nature. Forced labor survivors and supporters outside the Fukuoka High Court in 2004, after the court overturned their compensation award. Kang Jian is holding envelope at left. Among the lawsuits filed by Chinese war victims in Japanese courts seeking compensation from the Japanese government and corporations, eight cases are now in the process of being decided by the Japan Supreme Court (excluding the lawsuits already decided by the Supreme Court). Of these eight cases, seven are appeals by Chinese victims who refused to accept judgments by Japanese high courts. The other case is the appeal by the Japanese government and Nishimatsu Construction Corp., which refused to accept the Hiroshima High Court decision requiring them to compensate the forced labor victims. Although we filed written requests to hold hearings long ago, the Supreme Court has not scheduled any hearings in the cases appealed by the Chinese victims. Instead, the court recently decided (on Jan. 15, 2007) to hear the case appealed by Nishimatsu Construction Corp. and to hold a session for debating whether the Chinese government has, on behalf of Chinese citizens, given up the right of individuals to claim compensation. We must pay close attention to why the Supreme Court has chosen to hear the appeal by Nishimatsu Construction, and why the special session will focus on whether the Chinese citizens' right to claim has been abandoned. A. Background to Emergence of the Defense Argument, "Abandonment of the Right to Claim"
1. Nullification Defenses of "Statutory Time Limitation" and "State Immunity"
Since June 1995, Chinese war victims have filed lawsuits in Japanese courts in Tokyo, Sapporo, Kyoto, Nagano, Fukuoka, Niigata, Gunma, Yamagata, Miyazaki and Kanazawa, seeking compensation from the Japanese government and Japanese corporations. The lawsuits involve cases of massacre, indiscriminate bombing, abandoned chemical weapons and shells, Unit 731's experiments using live human subjects and its deployment of germ bombs, "comfort women" and cases of forced labor. There have been 27 cases in total. Before 2002, the Japanese government, as perpetrators, avoided facing the truth and taking responsibility by using the pleas of "time limitation" and "state immunity" in its defense. The Japanese corporations involved adopted a similar approach. Before 2000, verdicts issued by Japanese courts simply followed the Japanese government's assertions and ruled against the Chinese plaintiffs. On July 12, 2001, the Tokyo District Court, using the basic legal principle of equity and justice, for the first time rejected the defense of "time limitation" put forward by the Japanese government and recognized the claim made by the Chinese forced labor victim Liu Lianren. This result was achieved through the efforts of Chinese and Japanese lawyers, scholars, Japanese citizen support groups and the plaintiffs. Thereafter, courts applied the basic legal principle of equity and justice and rejected the "time limitation" defense in the following cases: Chinese forced labor victims versus the Japanese government and Mitsui Mining Corp. in Fukuoka District Court (decided on April 26, 2002); Chinese forced labor victims versus the Japanese government and Rinko Corp. in Niigata District Court (decided on March 26, 2003); Chinese victims of abandoned chemical weapons and shells abandoned in China versus the Japanese government in Tokyo District Court (decided in September 2003); and Chinese forced labor victims versus Nishimatsu Construction in Hiroshima High Court (decided on July 9, 2004). Also important was the case of Chinese forced labor victims versus the Japanese government and Nippon Yakin Kogyo Corp. (decided on Jan. 15, 2003). Although Kyoto District Court did not support the claim by Chinese plaintiffs in that lawsuit, the decision rejected the defense of "state immunity" for the first time. In cases later decided by the Tokyo High Court, Fukuoka High Court and Niigata District Court, the Japanese government's claim of "state immunity" was also rejected. Moreover, in all of the decisions reached by the Japanese courts, the facts of atrocities committed have been acknowledged as proven by the evidence given by the Chinese plaintiffs. From the above mentioned facts, we can see that the lawsuits seeking compensation from Japan have been slowly making progress. The trend of acknowledging the plaintiffs' claims has been gradually forming. 2. Emergence of the Defense Argument, "Abandonment of the Right to Claim"
At the end of 2002, when the lawsuits launched by the Chinese victims had been under way for seven years, a new defense argument was used by the Japanese government. It was asserted that "the plaintiff's right to claim for personal compensation has been abandoned as the result of treaties." This argument is called "abandonment of the right to claim." 1) Using the Sino-Japanese Peace Treaty as its basis, the Japanese government proposes that the Chinese people have abandoned the right to claim. On April 28, 1952, the Japanese government signed the Sino-Japanese Peace Treaty with Taiwan. The treaty recognized the principles of the San Francisco Peace Treaty. Some people contend that the right to claim of individuals has been waived by the San Francisco Peace Treaty, but that treaty has no such written provisions. 2) The Japanese government holds that the Joint Communique of the Government of Japan and the Government of the People's Republic of China was signed (on Sept. 29, 1972) on the grounds that the Sino-Japanese Peace Treaty had already resolved the issue of war compensation, and that the issue of compensation should not be brought into discussion again. Therefore, Japan holds, the right to claim of the Chinese with regard to the war had long been abandoned with the signing of the Sino-Japanese Peace Treaty. B. Rebuttal of the Defense Argument, "Abandonment of the Right to Claim"
1) China has not signed the San Francisco Peace Treaty and is not a member of the treaty. The treaty has no binding effect on China. 2) Further, the San Francisco Peace Treaty has not altogether negated the right to claim of individuals. During both the lawsuits involving Japanese detained in Siberia and atomic bomb victims, the Japanese government expressed its position had always been that what was abandoned (here referring to the San Francisco Peace Treaty) was not the individual right to claim, but the right to claim by the government on behalf of the individual, in seeking compensation from another nation (the right of diplomatic protection). But in similar lawsuits with Chinese as plaintiffs, the Japanese government offered a totally different interpretation. This practice of a double standard reveals the duplicity of the Japanese government in dealing with war responsibility. 3) The Sino-Japanese Peace Treaty was void, and even at the time when it was signed it was of limited application. As defined in an official exchange document attached to the Sino-Japanese Peace Treaty, the treaty could only apply to territory actually controlled by the Republic of China then and in the future. Therefore the Sino-Japanese Peace Treaty is not applicable to the People's Republic of China. Moreover, in 1972 when China and Japan restored diplomatic relations, the precondition was that the Japanese government agreed there was only one China. It was under this precondition that diplomatic relations between the two countries were restored and the Joint Communique was signed. Article 2 of the Communique states, "The Government of Japan recognizes the Government of the People's Republic of China as the only legitimate Government of China." Now the Japanese government is using the Sino-Japanese Peace Treaty it signed with Taiwan as its defense. This is an act that violates its position defined in the Joint Communique. 4) The Joint Communique has not abandoned the right to claim of the individual. Article 5 of the Joint Communique signed by the Japanese and Chinese governments in 1972 states, "The Government of the People's Republic of China declares that in the interest of the friendship between the Chinese and the Japanese peoples, it renounces its demand for war reparation from Japan." It is public knowledge that claimants arising from wars include states, groups and individuals. This is due to the characteristics of damages. Individual or group property cannot be substituted by state property. By the same token, the individual's right cannot be unconditionally taken over by the state. Any abandonment of the right should be expressed clearly. In the Joint Communique the Chinese government did not declare that it abandons the right to claim for Chinese citizens on their behalf. Therefore, as stated above with regard to lawsuits brought by Chinese plaintiffs, district and high court rulings before 2005 in places such as Tokyo, Fukuoka, Niigata, and Hiroshima did not support the Japanese government's position of "abandonment of the right to claim." On March 18, 2005, Tokyo High Court supported for the first time the Japanese government's position of "abandonment of the right to claim" in its ruling on the second batch of Chinese "comfort women" cases. The decision states that in 1952 when the Sino-Japanese Peace Treaty was signed, the government of the Republic of China was the "proper government" and the treaty it signed with Japan was valid. That is, in the court's view, the provision on war compensation is applicable to all of China and not restricted to certain territories. It follows that the Sino-Japanese Peace Treaty is applicable to mainland China. This judgment by the Tokyo High Court clearly violated the law and is provocative. It provides the world a dangerous signal from Japanese judicial circles. It was in this context that the Japan Supreme Court proposed to debate the issue of "abandonment of the right to claim" on March 16. As the party responsible for launching that brutal war of invasion, the Japanese government has never sincerely examined its role in the war, or accepted the unavoidable responsibilities for the war. Some Chinese war victims, with the support of conscientious Japanese lawyers and citizens, filed lawsuits in Japanese courts, hoping to solve through the legal process this important issue left by history. This, in fact, has provided an opportunity for the Japanese government and the Japanese corporations involved to correct past wrongs without losing face. Unfortunately, the Japanese government and corporations have not valued this opportunity. Instead they have employed all means and spared no effort to avoid shouldering responsibility. When their excuses have been refuted one after another, they proposed this new trick, "abandonment of the right to claim." Some Japanese judges, in order to absolve the Japanese government and corporations of their responsibilities, have gone so far as to cause a diplomatic crisis by violating the position of "one China" as established in the Joint Communique, concluding that the Chinese plaintiffs' right to claim has been abandoned through the signing of the Sino-Japanese Peace Treaty with the Taiwan government. If this excuse receives unjustifiable support from the Supreme Court of Japan, it will in effect put an end to all lawsuits filed by Chinese war victims. William Underwood, a faculty member at Kurume Kogyo University and a Japan Focus coordinator, recently completed his doctoral dissertation at Kyushu University on the topic of Chinese forced labor redress. He can be reached at kyushubill@yahoo.com. Kang Jian is an attorney with the Beijing Fang Yuan Law Office and a member of the All China Lawyers Association's Committee for Redress Claims against Japan. She provided this article for Japan Focus. Posted at Japan Focus on March 2, 2007. This article is reprinted with permission.